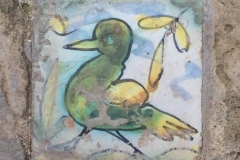 Wed 17/2/16: A day of great excitement for me- a visit to the home of sherry Jerez and a visit to Gonzalez Byass. We caught the train from main town Seville, so an early start for us motorhomers and that’s not because we are lying in bed, but the day takes so much longer when toilet activities and breakfast all are more complicated, no switching on electric kettles or jumping in the shower. Arriving in Jerez we immediately loved the place- a sort of in between mix of Cadiz and Seville but with it’s own character because nowhere else can say its home for sherry- like champagne region there can be impersonators and they might be very good but sherry you can’t be unless from this stable. To aid the walk into the town it was sunny so again everything looked wonderful and they were gearing up to a flamingo festival as well in the main square. 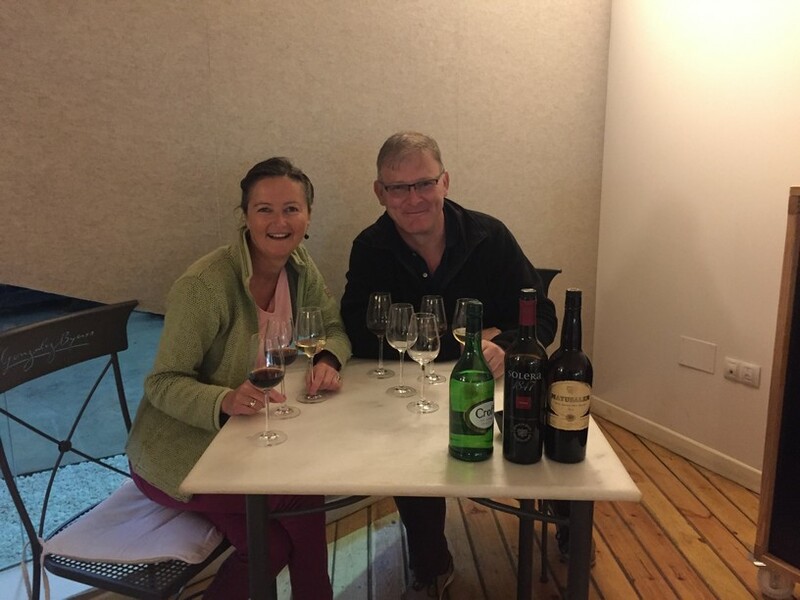 To be honest we would have liked to have stayed in the actual town but we were unable to find any parking areas that were easy or that beneficial to us and so we opted for the train, but will certainly put Jerez on the return to list. What can I say about the tour beyond the pictures really, the tour and our lovely guide were just wonderful and an absolute piece of history. Barrels signed by many many famous people and also it still gives over a small amount of sherry each day to an unpaid for visitor- the mice. 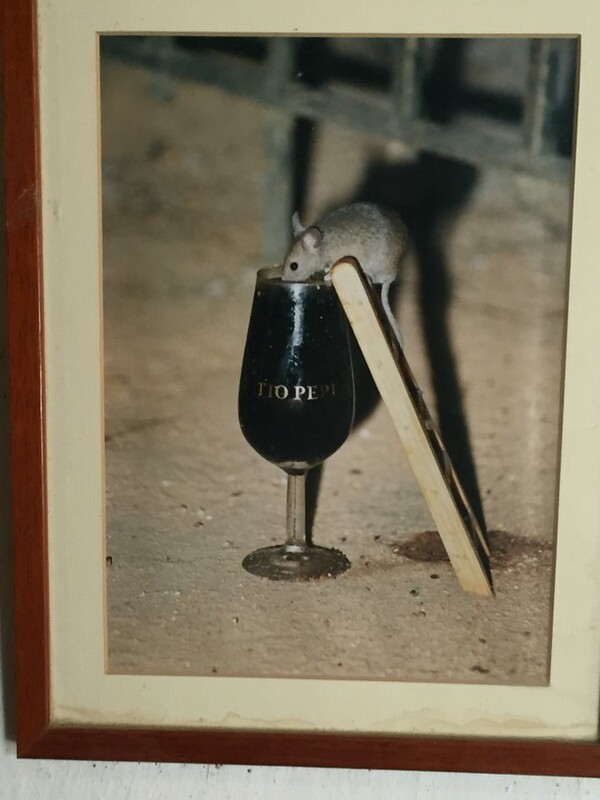 The photos you see are true, they leave out a small glass of sherry for the mice who unavoidably occupy this space as well as the distillery and barrels and Yes, the little mice come and drink from the glass that they put out each day from them- which is their favourite, well who knows but for me they all were and the visit was an absolute highlight of my Spain travels thus far. Uncle Joe-= (Tio, Spanish for Uncle. Pepe, Spanish equivilent of Joe). You might be pleased to know we did have food that day and did finish the day with the usual soak up food of pizza and spag bol near home, extremely welcome, tasty and cheap! strange cowboy town. Before leaving the actual area we gave NiKi a much deserved wash and whilst David was doing that I strolled down to a road side vendor who was selling local strawberries and beauties they were as I ate a few whilst walking back just to make sure they were up to scratch. Plus the few eaten hardly made a dent in the box load brought all for €3 and I could have had 3 boxes for €5, way too many for 2 as I tried to explain to the vendor. Dinner tonight was home cooked and one of David’s favourites at home, chicken pasta. Fri 19/2/16: Was a bit of a mistake on the food front but a nice mistake. 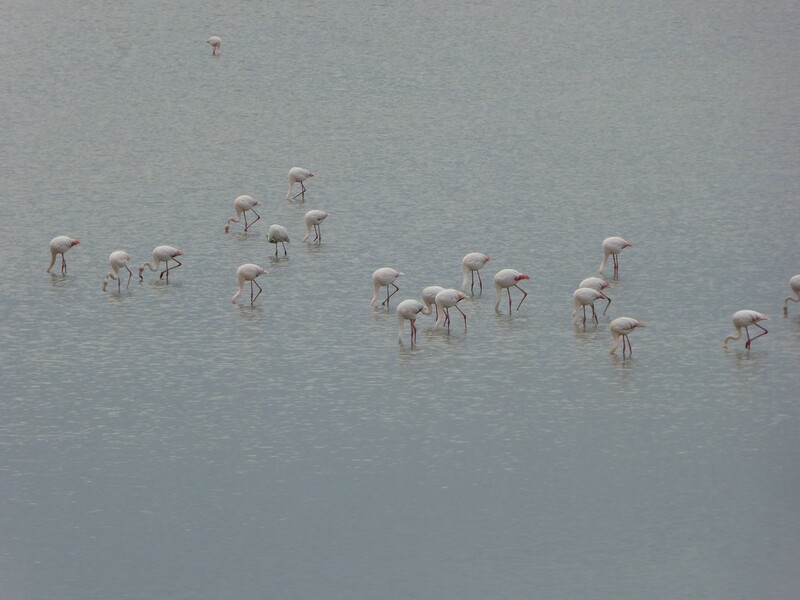 We headed into the village and had a good wander around and sat in a lovely bird centre overlooking the lake and watched the flamingos which are as ever a great favourite of mine. How they stand on those legs amazes me and such a lovely pink and not being great on what birds are what I can at least recognise these! We watched the horses roaming around and headed back to the main area to sit and have a small glass of something and could smell the most wonderful aroma coming from inside the restaurant. There was nothing obvious being cooked that we could see and nor could we really tie the smell particularly with anything on the menu, other than the place was known for its lamb (quite unusual meat for this part of Spain) and also veal. So we decided to be brave and again in broken Spanish said we would have one of whatever was cooking and then not sure what happened but when lunch arrived it was Revueltos- which is scrambled eggs running through potatoes and with this one a variety of cooked meat. Again this was a first for us as we had thus far avoided this ‘scrambled’ which is the literal translation, but again in future we definitely won’t as it was a very scummy meal. The 2nd dish was a very very big veal sirloin, which I have to say was in my opinion the tastiest meat we have had thus far here. A very big lunch and not what we would have chosen necessarily but not a bad mistake at all. A long walk in the park was required after that for sure. Sat 20/2/16: Bacon butties again for breakfast but for me I opted to have a half full English- bacon, egg and baked beans with Daddies sauce and tabasco. Yes the last three were all brought from the UK only because they were in the cupboard not because I am wedded to them, although the baked beans were lovely and I might have to pay the price here and buy some Heinz! Sun 21/2/16: Time to move on from cowboy town and the very nice people we had meet and re-joined up with at this site. Which probably to date was the largest camp site we have stopped at, and it didn’t fall short on any standards for being such a large site. After watching a parade in town into the church from one of the brotherhoods we left and headed onto Carmona where we were hoping to stop one night in a parking stop as the town is very pretty, but unfortunately after driving up and down the road and around the roundabout many times we couldn’t actually see where the parking spot was so we reverted to plan b and after again a few hairy moments in the centre of town and Snoopy trying to take us up a road by the side of the castle that was fortunately marked as ‘no access for motorhomes and caravans’ we found a nice large layby on the road out of town and parked there and had a quick wander around the town and a rather nice lunch. We were hoping to bring ourselves a bit down on our budget and have just a few tapas, as our meals of late had been quite substantial and therefore a bit more costly, but the restaurant as given in our guide book had other ideas and after finding it and then making the waitress find us a table in this very busy restaurant we found there were no tapas on the menu. Of course we did the true British thing and stayed put, the budget would have to wait. We were both glad we did- David had lovely baby lamb chops and I had the most wonderful warm mushroom salad- the description was just that but came along with the mushrooms some pieces of foie gras and also a Pedro Ximenez dressing- I really would have liked that dressing recipe, and I guess for those more talented chefs then you probably could have come near after tasting it. Mon 22/2/16: Another food disaster day or rather lack of food disaster day. We are now completely rural so for us townies and not yet completely motorhomers we have no food and have come to expect tapas, as in the paid for variety at every turn or every bar for sure. Arriving in the beautiful world of olive tree country life took a slightly different turn. We pitched up and after instructions of cycle or walk routes from our lovely host we rode off through the olives to the next small village and arrived after the lovely sunny ride in a small town square where there was a bar and a number of tables with locals sat wrapped up warmly against the 20+ degree heat and drinking their beer and so we joined them and unwrapped a few light layers until down to our shorts and tee- shirts. With our drinks came some crisps and then some jamon on bread and then the next round some anchovies on tomato, all looking good. ‘Comer’ we asked the young waitress, ‘No comer’ she said, only at weekends but I can get you some croquettes if you would like. Yes, that’s fine we said thinking we’ll eat that evening in our village. Off we cycled some more and back through our slightly smaller village and we noticed it had more restaurants/bars- fine we thought, a short walk tonight and a good choice for food. After a bit of discussion of how long to stay here we upped it to longer as Cordoba is an easy bus ride from right outside the front gate and with that we asked about the best place to eat in the village. Probably the hotel at the far end of town was the given choice as the other places only do ‘tapas’. So off we set and thinking we only actually want tapas we decided to stretch our legs and see what the small hotel was like. Lovely, a small family run establishment with what seemed to be a good food choice, and with our drinks came a large plate of crisps, lovely we thought but quite a few really given we were going to eat in a mo, probably on my friend Lorna’s school of nibbles with drink scale. So after 2 drinks there, we set off in search of our dinner of tapas. Next bar was a ‘pizza’ place but no sign of life there. No worries, David had liked the look of the Pena Flamingo bar and so we headed there. As we walked in we quickly realised no food here either but we were given some nuts/corn kernels with our drinks. Worrying thoughts came to us as we were now down to 2 bars on the way back and the road back to the hotel was quite far. Still not a problem in our world, as we know all petrol garages here are a world of good food and at the worse we could buy something, some jambon or dollop of cheese. So we passed the next bar, now all closed up. Never mind we love the garages and have had many a good sandwich on our travels. We approached with trepidation as now we were getting hungry for ‘proper’ food not nibbles, and still our faith held out and we burst through the doors full of hope and ready to order whatever they had. The doors burst open and the locals of which there were many all turned to look at us and then made way for us at the bar. We looked and looked for a menu or some choice of tapas on the bar but nothing. We looked around the garage for the food shop and nothing. Nothing of nothing food wise at all, but as we looked around every local had a plate full of monkey nuts with their drinks and there were monkey nut shells all over the floor. We quickly ordered our drinks in case the monkey nuts ran out and Yes lo and behold we got our dinner for the night- monkey nuts and what a treat they were so much so that we ordered another round of drinks to ensure we got our fill of these treats. So learn a lesson, tapas don’t always mean tapas, sometimes in rural areas here they are actually tapas- a free ‘cover’ given with your drink. So for that night a healthy dinner of crisps, nuts and monkey nuts was had and I think for me the monkey nuts came out on top. Tues 23/2/16: After the night of nibbles we had learnt our lesson and so we rode off into the distance towns and in search of the first restaurant we could find in the next bigger village. A lovely cycle was had and we rode around Le Victoria at the appropriate nearly lunch hour in search of bars. A few circles were done and nothing seemed or looked open. Ever optimistic again we decided to ride on to Las Ramblas a much bigger town and quite a bit further on. 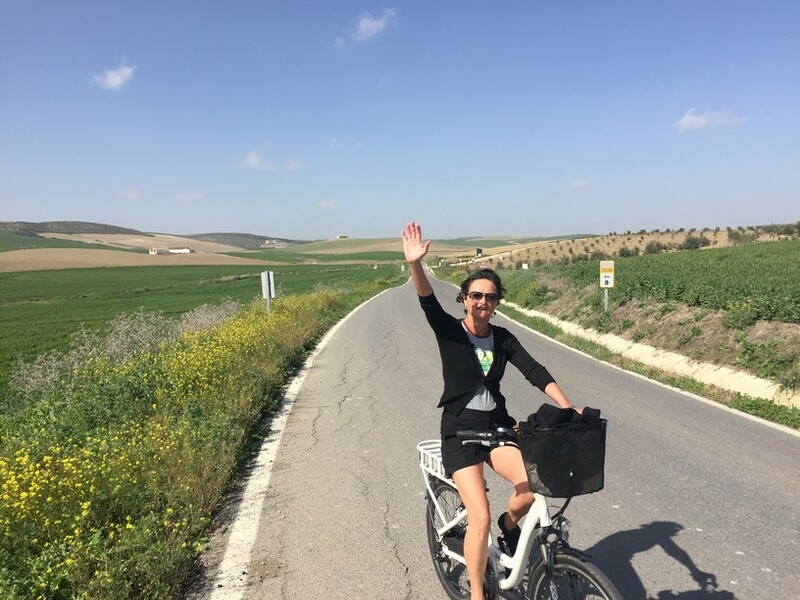 By now the sun had decided to shine on us and a lovely ride was had through olives, wheat and who knows what and then we hit Las Ramblas, lots of tourist info boards on the way in and our hearts rose- this was it to make up for last night. We circled and cycled and read and read the tourist boards- Las Ramblas is the place for pottery and there is even a pottery museum there. But that was shut along with every likely looking bar option. Eventually we happened upon a small drinks bar with a good few locals in it and decided that we needed to make a plan, so we cycled in and ordered a drink, with which came a lovely tapa of black pudding and some olives. Yum but not enough, but then we saw on a black board a few other food choices and without much debate quickly ordered whatever we knew in Spanish to ensure we got some food for the day. The bar might have been small with only a tiny single sink kitchen but the tapa were lovely- we had anchovies and again they came on toast, pork in a lovely tomato sauce and a wonderful beef dish that again was melt in month. Thankfully we had found food for the day but boy it was hard work. Obviously rural eating is not the same as town eating a lesson to be had, but not too much of a worry for us now we were off to Cordoba tomorrow and we certainly knew we would get fed there. 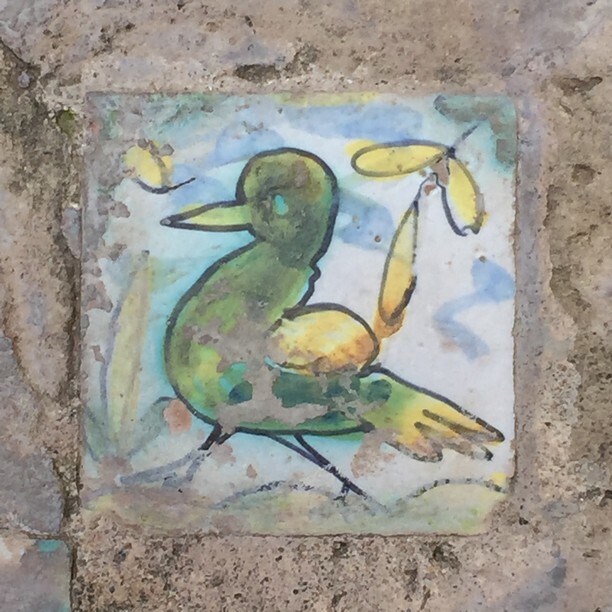 Cordoba highlights to follow and Karen’s dream food comes home……. 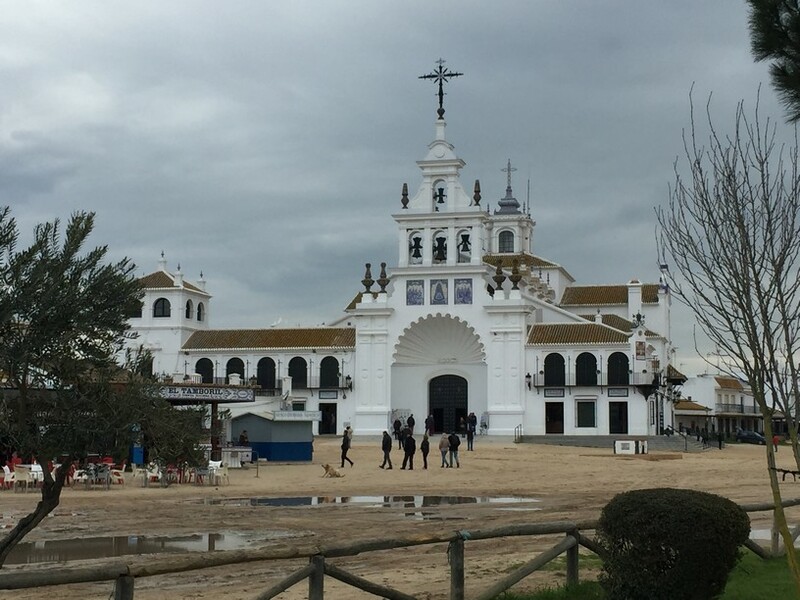 Palos – El Rocio – Cordoba. The understated, the surreal and the magnificent. Monkey nuts for dinner so many comments I could make BUT I wont ! 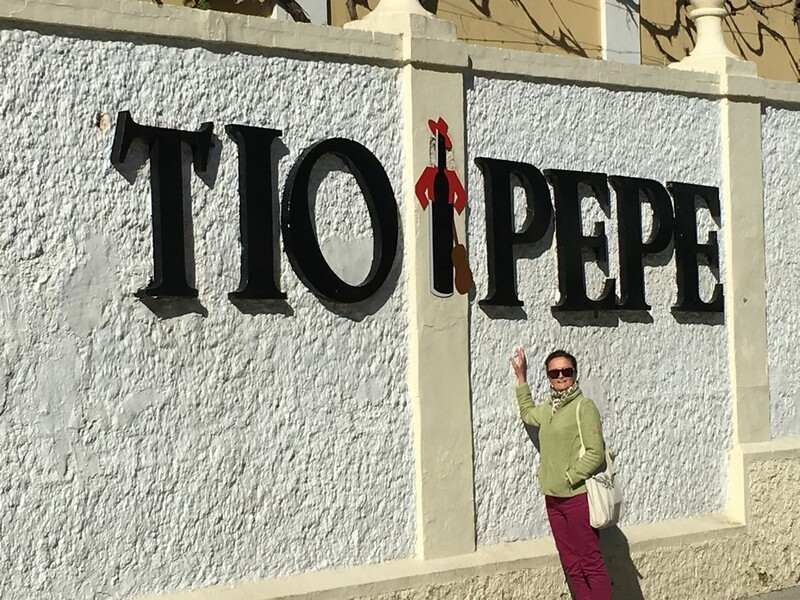 So glad Tio Pepe was open otherwise Karen would have scaled the walls ! We are trying to keep the oven pristine, and have not taken the plastic off yet!!!! Thick, gloopy Reducción de Vinagre de Pedro Ximenez comes in 250 ml bottles: try Mercadona own brand( Hacendado). It’s not expensive either.